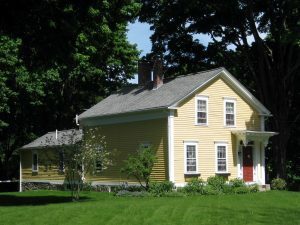 73 Austin Avenue, Greenville, R.I. According to the book, “Historical And Architectural Resources Of Smithfield, Rhode Island”, published in 1992 by the Rhode Island Preservation Commission, this house was built circa 1885, and in 1895 was owned by P. McAuley. Filed Under: Photos, Test Page 1 Tagged With: Historic Homes Greenville R.I., Historic Homes Smithfield R.I.
On May 30, the Panzarella-Silvia Memorial was dedicated at the intersection of Whipple Road and Douglas Pike. Army Lieutenant James F. Panzarella was the commanding officer of Company A, 196th Light Infantry Brigade. Army Staff Sergeant Clifford William Silvia was attached to the 25th Medical Battalion of the 25th Infantry Regiment. Both men were from Smithfield, and both were killed within a few weeks of each other while serving in Vietnam. The dedication ceremony began with a parade which left the Town Hall at 8:45 a.m. The procession included family members of the servicemen, civic leaders, members of the Town Council, buglers and drummers, police and fire vehicles, as well as numerous townspeople showing their support. David A. Brann of Greenville was serving aboard the aircraft carrier U.S.S. Boxer. Lieutenant Steven F. Wyman of Esmond was cited for his outstanding performance during his flight training at Vance Air Force Base in Oklahoma. U.S. Army SP4 Paul Trask was serving with the 124th Transportation Battalion. U.S. Air Force Sergeant Angus E. Bryant of Spragueville returned home from duty in Germany where he’d been stationed for three years. Ralph Iannitelli of Greenville was presented with the American Legion Reserve Officers training Corps Gold Medal for Military Excellence at the 16th Annual Air Force ROTC Presidents Review held at Denison University. The Apple Blossom Club of Smithfield received the Carolyn B. Heffenreffer Silver Bowl Award, and the National Council Blue Rosette for Achievement Award in Home and Garden, for their work relating to civic beautification within the town of Smithfield. Among their recognized projects was the planting of nine pink-flowering Hawthorne trees in Greenville center. Those present to receive the awards were Mrs. Harry Judson, Mrs. Joseph Casale, Jr., Mrs. Elwood Kelley, Mrs. Richard Illingsowrth, Mrs. Prescott Williams, Mrs. Adrien Leboissonniere, Mrs. Raymond Shirley. Mrs. Roland Smith, and Mrs. Lionel Jarvis. On May 10 the Smithfield High School band gave a spring concert in the school auditorium. Leon Carney of Greenville was elected President of the Smithfield Jaycees. Boy Scout Troop 3 of Greenville held a Mother’s Day breakfast on May 12. Eagle Scout William LeBlanc was the main speaker. Michael Kiely and Richard Gill were voted to attend the Order of the Red Arrow, an honor for which they were selected by the rest of the troop. Old Stone Bank was offering a Capitol Savings Account that would yield 5% interest per year. Miss Linda E. Aitken of Greenville won the Miss University of Rhode Island beauty contest and the right to compete in the Miss Rhode Island pageant on June 22. The 8th Annual Apple Blossom festival was held May 19th at the Smithfield High School. Entertainment included music, dancing, and a contest in which young women competed for the title of Miss Apple Blossom Queen of Rhode Island for 1968. Perhaps there are some who remember a building that once stood on Route 44 in Harmony known as the “Cutler Stand”, a.k.a, “The Philip’s Place”, and “The Old Tavern”. The building, which dated to circa 1800, was slated for demolition in May of 1968, but certain architectural features such as doors, windows, and fire places were to be salvaged. On May 22 the United States nuclear submarine, U.S.S. Scorpion, was lost with all hands about 400 miles west of Azores. Theories as to what happened range from a catastrophic internal malfunction to a torpedo strike. Today the remains of the vessel lie in 9,800 feet of water. First published in Your Smithfield Magazine, August – 2013. On the afternoon of October 29, 1978, a hot-air-balloon made an unscheduled landing on Stillwater Road in the vicinity of Route 295. Nobody was hurt, and the event was soon forgotten. However, another balloon landing more than sixty years earlier created a little more excitement, but more on that later. Most tend to regard air travel as beginning with the Wright Brothers in 1903, and would be surprised to learn that man has actually been navigating the sky since 1783, when two Frenchman became the first humans to soar aloft in a balloon over Paris, France. The first balloon flight in America occurred ten years later. The advent of manned balloon flight gave rise – pun intended – to a new term used to describe those brave enough to conquer the wild blue: “aeronaut”. Aeronauts faced constant danger. Early balloons used lighter-than-air gasses that were both toxic and flammable, which sometimes led to disastrous accidents. Once aloft the aeronaut was at the mercy of prevailing winds and surprise electrical storms. Ground fog was another hazard, for aeronauts navigated by line-of-sight with nothing but an altimeter and compass. Without the ability to see the ground they could easily become lost and landing in fog was risky. Their worst nightmare was to be blown out to sea, for it meant almost certain death as weight considerations didn’t allow for rescue rafts. Yet despite the hazards, the call of the sky was irresistible to those who bravely set forth to establish world aviation records, and to be one of the few humans to witness a view heretofore reserved for birds and gods. It is unknown who made the first balloon flight in Rhode Island, or when, but it might have been a member of the famous Allen family of Barrington, known throughout New England for their aeronautical exploits. The patriarch was James A. Allen, born in 1824. Allen made headlines when he took off in a balloon from Exchange Place in Providence on July 4, 1857, on what was his first solo flight. He went on to complete more than four-hundred more balloon flights during his lifetime. When the American Civil War erupted in 1861, Allen enlisted in the Union Army where he served as a “balloonist”, acting as an artillery spotter. Although he survived the war without a scratch, he suffered several injuries while “ballooning” in subsequent years. One time in 1866 he crashed in Dedham, Massachusetts, injuring himself and others, among them his 8-year-old son, James K. Allen. Despite his misadventure, James K. followed in his father’s footsteps, and made his first solo flight five years later. James K., often referred to as “Professor Allen” in press clippings, enjoyed thrilling onlookers by jumping from balloons from an altitude of 3,000 feet using a parachute of his own design. Like his father, Professor Allen had his share of adventures and narrow escapes from death. On one occasion in 1886, the good professor ascended from Providence carrying a newlywed couple married aboard the balloon only moments before. The couple; Edward J. Davis and Margaret Buckley, are perhaps the first people ever to be married in a balloon, and then carried aloft to their honeymoon destination. Just when it seemed the day couldn’t get any more exciting, the balloon ran into trouble over Easton, Massachusetts, and came down in a swamp. The occupants had to hang on for dear life as heavy winds dragged the conveyance through the water. Fortunately, all were safely rescued, but the newlyweds decided to continue on to their honeymoon destination by train. Perhaps Allen’s most memorable adventure occurred on July 4, 1906, when he nearly drowned in his balloon. After lifting off from Providence an unforeseen weather front quickly carried him out over the ocean, and the Professor was helpless to do anything. Around midnight the basket hit the sea and began to sink, but Allen quickly released some of the weighted ballast bags and the balloon rose enough to pull him out of the water. He repeated this process once more during the night. By morning a passing steamer came within a mile of him, yet for some reason the lookout failed to see the massive balloon on the open water and the ship sailed on. Salvation came later in the day when he managed to throw a line to a passing fishing boat. As to the other unscheduled balloon landing in Smithfield mentioned earlier, it occurred on the evening of November 22, 1914, when the large craft descended on the Latham Farm located near Present-day Log and Burlingame roads. The balloon was the famous Boston which belonged to the Aero Club of New England, a Massachusetts based organization that still exists today. The Boston had departed from Worcester about ninety-minutes earlier in view of fifteen-hundred spectators who cheered loudly as the balloon shot up to 3,000 feet and began drifting in a southerly direction. The intended destination was Providence, and an automobile was sent ahead to meet the balloon when it landed. Aboard the Boston was its’ pilot J. Walter Flagg, and two passengers. As the balloon gradually climbed to an altitude of 5,400 feet, its occupants were treated to a magnificent view of five New England states, a rare sight indeed for that generation. Such views were not for the squeamish, for the occupants stood in a small wicker gondola suspended beneath the balloon that didn’t contain safety belts! Somewhere near Uxbridge the Boston began loosing altitude as a temperature inversion quickly cooled the hot gas in the balloon. Flagg had to jettison several ballast bags in order to slow the decent and prevent a hard landing, or worse. Yet by this point the Boston had lost 1,800 feet of altitude and continued to gradually do so as it continued southward across the Blackstone Valley, Woonsocket, and finally, Smithfield. By the time they were over Smithfield the Boston was but 300 feet in the air, and Flagg began looking for a place to set down. The Smithfield of 1914 was not as wooded or developed as the Smithfield of today, and looking below, Flagg saw open farmland belonging to H. J. Mowry and dropped a “drag rope” and called for assistance. Three men, J. H. Schlemner, James Murphy, and Robert Quinn, gave chase attempting to grab the rope, but were unsuccessful. The balloon then passed over some apple trees and continued on to the adjacent farm of D.W. Latham, where Albert Latham and seven of his ten children caught hold of the rope and helped bring the Boston down for a safe landing. 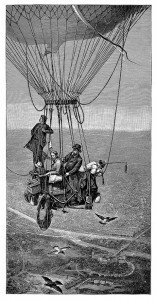 After securing the balloon, the Latham’s invited the aeronauts into their home for dinner and some rest. Incidentally, this was not the Boston’s first visit to the area. Just over five years earlier, on June 29, 1909, she passed over northern Rhode Island and landed on a farm in Pascoag. This event received extensive media coverage, perhaps due to the famous pilot, Charles J. Glidden, founder of the Aero Club of New England. By 1914, the “golden age” of ballooning was all but over having been rapidly eclipsed by the airplane. The advent of those “daring young men in their flying machines” relegated ballooning to more of a sport rather than a way to thrill crowds and set new aviation records. Today’s balloons use hot air rather than gas thus making them safer than those flown a century ago, and even though a view from the heavens is more commonplace in 2013, the thrill remains the same.